Recently I have shared a gadget which is a globe like revolving categories or labels, today I am back with a new gadget. It is sitemap/menu. You might have seen the sitemap/menu while surfing 101Helper. If you haven't seen it before click here. Sitemap helps users to find all the posts of a blog on one page, in other words it is a navigation page. It also helps in seo by linking all the posts on one page in list view. It also helps search engines to index the sitemap of your blog where a visitor can find all the posts easily. It has a simple, neat, clean and a broad look. It represents all the posts of your blog in list view. 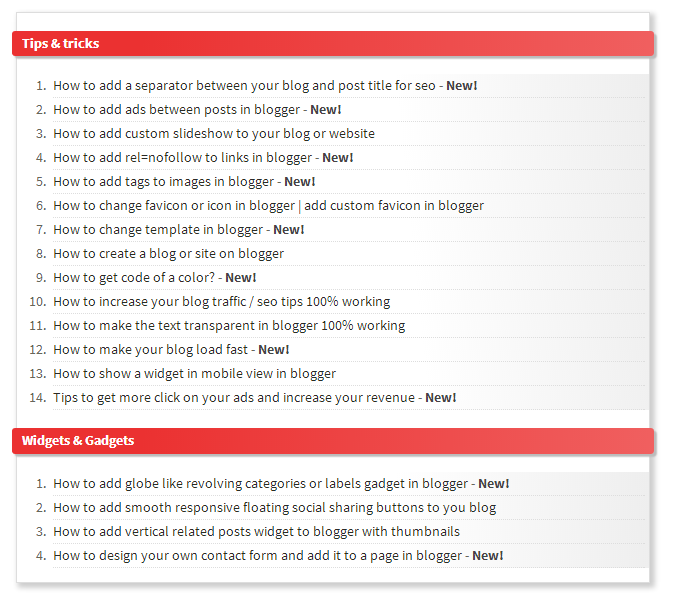 It acts as a navigation page in your blog as it contains all the posts of your blog in list view. You don't need to maintain the sitmap. It works automatically when you post a new article it will index it and mention (new) with it and after somedays the (new) will disappear automatically. It shows your blog posts in a labeled manner. How to add this widget? (1). Go to blogger and login to your account. (2). Go to pages tab and create a new page. Give it a title either Menu or sitemap. (3). Copy the below code. (5). Now change the http://www.your-blog-link.blogspot.com and replace it with the link of your blog. (6). Save the page and visit your blog. Note: If you haven't labeled your posts then this sitemap won't work, so label your posts while writing a post otherwise you will see an empty sitemap or an empty page. If you have any problem related to this gadget ask me in comments or E-mail me at fahimraza101@gmail.com. Share with others. Follow and subscribe for more tips, tricks,gadgets and widgets. I saw your blog(lifeprinciples4you) and I have figured out that your sitemap isn't showing any link because you haven't labeled any of your post, try to label posts first and after that reload your sitemap page, it will start showing posts. Oh is that why? so let's say I have a post titled "patience is strength" what could I label it? You can label it as "Tips to be happy in life" or "Benefits of patience" or anything you like, actually you have to just categorize it if you want to show links in sitemap..
Yeah why not +Admin - salah, you can leave your link here in comments, it will work as a back-link. And you have a nice blog. Did you reply the URL of your blog ? If yes and you are getting the error just dismiss it and publish your page. thx a lot . your post was really helpful . since morning i was trying this and visited so many sites but none of them worked . yours just worked without any hassels. thanks once again.